Order your own copy of the Legend of the Five Rings Roleplaying Beginner Game at your local retailer or online through our website today! It’s time to enter the Topaz Championship! The Legend of the Five Rings Roleplaying Beginner Game is on sale now! 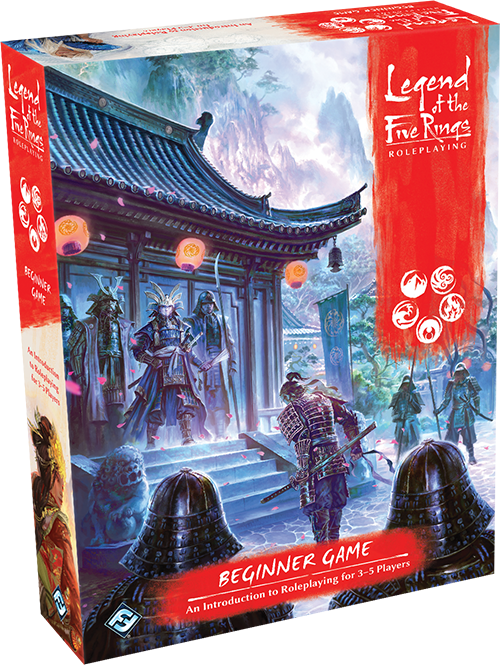 Within this Beginner Game, players and Game Masters gain all the tools they need to begin their adventure in Legend of the Five Rings Roleplaying. Custom dice, tokens, and maps bring the Emerald Empire to life. Meanwhile, four character folios keep the rules at player's fingertips, allowing them to jump into the action without fretting over mechanics. The Game Master also receives an easy jumping-on point with the pre-made adventure featured in the box, giving them everything they need to keep the action flowing. All this and more awaits in the Legend of the Five Rings Roleplaying Beginner Game! If you’re looking for more even more, be sure to download three additional folios for the Crab (6.4 MB), Scorpion (6 MB), and Unicorn (6.2 MB) Clans on our website, as well as a free follow up adventure (23 MB)! The recent, untimely, and mysterious death of the Emerald Champion, Doji Satsume of the Crane Clan, has thrown the Emerald Empire into turmoil. Each of the Great Clans suspiciously eyes the others and wonders whether the death was no tragic accident, but a dishonorable act of murder. In these times of strife, a group of youths approaches the village of Tsuma for the Topaz Championship and their gempuku, the coming-of-age ceremony that will mark them as fully fledged samurai. Each contestant has come from a different clan and dreams of being the highest-scoring contestant in the tournament, earning the title of Topaz Champion. Despite being pitted against one another, they are all united in their desire to succeed and bring honor to their clan and family. Not everyone in Tsuma has honorable motives for the contest, however. Personal vendettas, supernatural visitations, and deadly sabotage may undermine the following days—unless the new arrivals stay true to the Code of Bushidō and act as the honorable samurai they seek to become. These are the circumstances surrounding your first adventure in the Emerald Empire. If this is your first time as a player in Rokugan, the Beginner Game is the perfect place for you to start. Not only do the pre-made characters offer plenty of choice without overwhelming you with mechanics, they also give you all the information you need to play the game. The Game Master will slowly reveal what these stats mean, easing you into the crunchier parts of your adventure. You can also look for helpful reminders of what these stats mean throughout the folio. Each character is unique in their own way. You may become a master of mystic martial arts with the Dragon Togashi Yoshi, or the pinnacle of grace and diplomacy with the Crane Doji Ren. The choice is always up to you. For a full preview of the player options in the Legend of the Five Rings Roleplaying Beginner Game, click here, and for a look at two of the characters featured in the Topaz Championship adventure, click here! Taking on the role of Game Master can be intimidating, but the Beginner Game eases you into the role. The pre-made adventure, “The Topaz Championship,” will walk you through how to guide your players in the world of Rokugan, with mini-scripts giving you the perfect words to describe actions your players may take. The Legend of the Five Rings Roleplaying Beginner Game gives Game Masters all the answers they need for their player's questions! The adventure slowly introduces mechanics as they come up, letting you and your players become acclimated to the Legend of the Five Rings Roleplaying system. 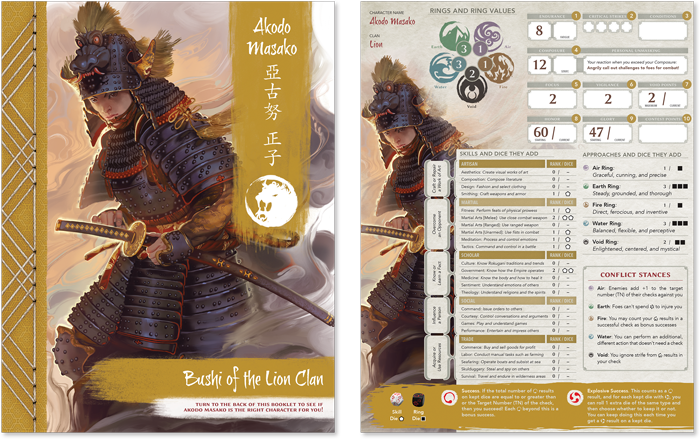 For a full preview focusing on Game Mastering in the Legend of the Five Rings Roleplaying Beginner Game, click here! 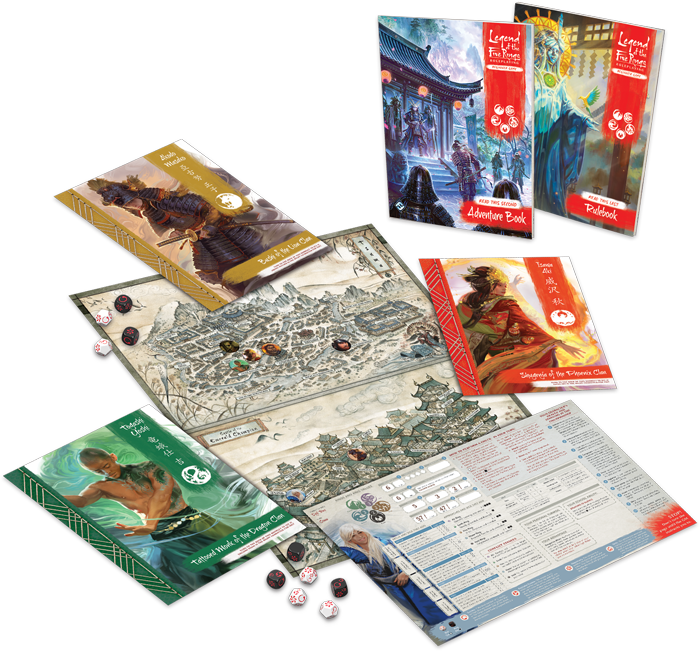 With a pre-made adventure designed to introduce the land of honor and steel, the Legend of the Five Rings Roleplaying Beginner Game is the perfect starting point for adventures in Rokugan. If you are interested in more from the Emerald Empire, look for the release of the Legend of the Five Rings Roleplaying Core Rulebook, releasing this fall, and the free adventure “In the Palace of the Emerald Champion,” available for free download on our website today! 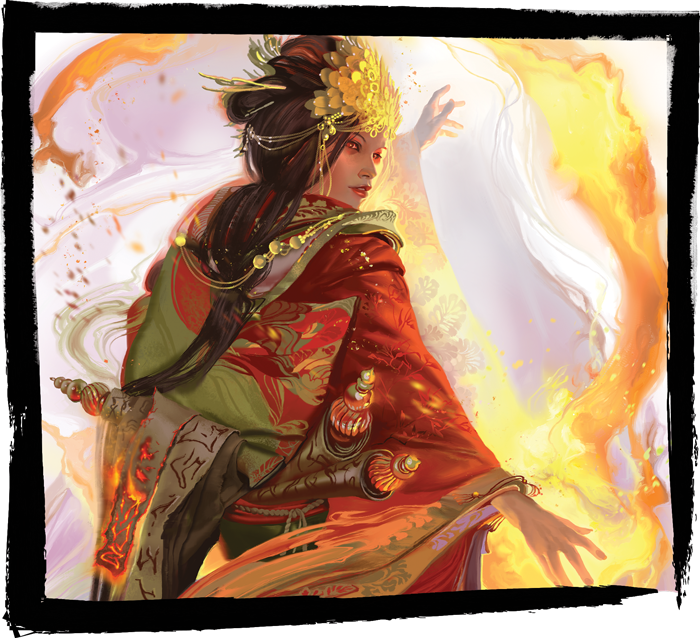 Enter the Topaz Championship with the Legend of the Five Rings Roleplaying Beginner Game (L5R01), available now from your local retailer or our website!